We often use the term “D-Day” to describe a day of great importance, but do you know the historical connotations of this term? 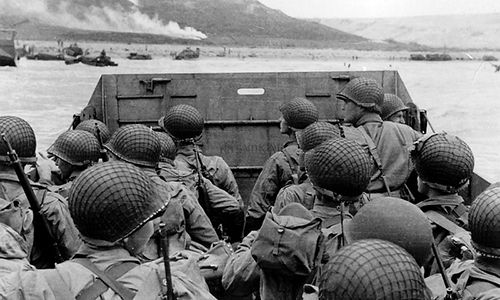 Here are 16 facts about D-Day you might not have learned in school. Fact 1: June 6th, 1944, the day that 150,000 Allied troops landed on the shored of Normandy is known as „D-Day“. Why was this historical event termed D-Day? Does the „D“ stand for decision, disembarkation, departure? There are many theories behind the meaning, but the most plausible is the explanation given by the U.S. Army and published in their manuals. D-Day was traditionally used to indicate the time or date of an operation’s start. An event would occur on “H-Hour” and “D-Day” before the actual date and time were assigned. The day before “D-Day” was known as “D-1” and the day after “D+1”. Fact 2: D-Day was scheduled for the 5th of June 1944, but due to poor weather, General Dwight D. Eisenhower decided to delay the invasion. The weather is often mentioned as contributing to the success of the operation. Fact 3: The overall invasion plan was termed “Operation Overload”. These code words were used to try to keep the event a secret and to stop operations from being confused. Operation Neptune was a part of Operation Overload and referred to the seaborne invasion which was the main part of the attack and which lasted from June 6th to June 30th. Fact 4: Plans for this operation, “D-Day” began in 1943 after Winston Churchill, F D Roosevelt and Joseph Stalin, the allied leaders, met in Tehran. Eisenhower was appointed Supreme Commander of the Allied Expeditionary Forces in December of 1943 and was tasked with the challenge of planning and merging land, sea and air forces which culminated in the D-Day invasion. Fact 5: Normandy was chosen for the attack because it was seen as the most unlikely place for an invasion. German troops did defend this area, but not as strongly as the other enemy occupied territories. Fact 6: Artificial harbors termed “Mulberry harbors”, were towed across the Channel and put together off the coast of Normandy. They could daily move 7,000 tons of vehicles and goods. Fact 7: Operation Fortitude was an operation invented to conceal the location of the D-Day landings. Allies leaked false plans and set up fake camps in order to confuse the Germans. Fact 8: Around 156,000 troops landed in Normandy on D-Day. Approximately 73,000 American troops attacked at Utah and Omaha, 61,715 British troops took Gold and Sword Beach, while the Canadian’s attacked at Juno. Fact 10: 110,000 troops died on D-Day: 77,866 German, 9,386 American, 17,769 British, 5,002 Canadian and 650 Poles. Fact 11: The night before the invasion took place Winston Churchill said to his wife; “Do you realize that by the time you wake up in the morning 20,000 men may have been killed?”. Fact 12: D-Day was the largest amphibious operation in the history of warfare. Fact 13: British infantrymen were paid £3 15s a month, while the Americans received nearly four times more, £12 a month. Fact 14: In Allied nations the invasion was broadcast live on radio. Fact 16: Theodore Roosevelt Jr,. son of U.S. President Teddy Roosevelt, stormed the beaches of Normandy. He was 56 at the time and was the oldest man and only general to be a part of the first wave of the invasion.